Cam's Cinematic Episodes: Film Review: BORAT! Lives Up To The (Excessive) Hype! Film Review: BORAT! Lives Up To The (Excessive) Hype! I don't know about the majority of you, but I don't find most comedy films to be particularly funny. In fact, I sit through the majority of them in silence with perhaps an occasional smirk at best. I think the main problem is that mainstream comedy is bland. 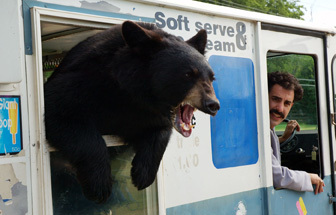 Films like Nacho Libre, Guess Who or Anchorman are, frankly, (often very) mildly amusing at best. That's why I gravitate to more quirky fare like Kevin Smith's films (Clerks 2 was the last great comedy I saw), and shows like Arrested Development and Curb Your Enthusiasm. It's a sad testament that I laugh more hysterically watching Shark Attack III: Megalodon, than the last 10 big studio comedies combined. So, it was with great surprise that I responded so strongly to Borat!, a film that has been thrown in my face by every mainstream entertainment media group possible for the last few months. To be honest, I wasn't prepared to be as entertained as I was. I had been well aware Borat! : Cultural Learnings of America For Make Benefit Glorious Nation Of Kazakhstan's (This is the only time I'm using its full title!) arrival for a long time, but I really was not interested. This is tied to the fact that my only exposure to Sacha Baron Cohen (Borat, himself) was through his a ppearances as Ali G in Madonna's Music music video and hosting the European Music Awards one year. To say I found these bits unfunny would be a massive understatement. I thought he was stupid and painfully unfunny. Cringe-inducing, even. So, believe you me, I was not someone eager to slap down $10 to see the man projected in front of me for 90mins. But then a strange thing happened. I kept hearing how hilarious the movie was. How brilliant and unforgettable a film, to be seen at all costs. Despite my attempts at ignoring the hype, I became curious. Was this a movie I would personally enjoy? Would it ACTUALLY make me laugh? Could it potentially be better than Shark Attack III? Well, I had to find out dammit! As a film enthusiast I make it a point to see pretty much every film that makes any sort of noise (Hence why I see so many bad movies...) and Borat! was making a lot of noise. So, last night I went to the 9:40 show at my local theatre and was stunned! Now for those not bombarded by the hype, Borat! 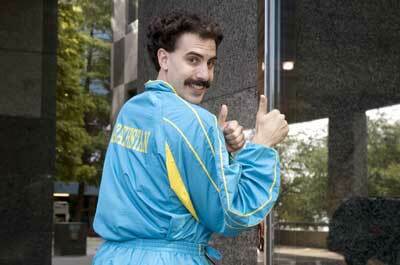 follows Borat Sagdiyev (Sacha Baron Cohen), a famous reporter from the country Kazakhstan. He's travelled to America, with his producer Azamat Bagatov (Ken Davitian), to make a documentary about American customs and behavior to show the people of Kazakhstan. The film follows his adventures as he interviews regular folks, hopelessly mangles North American conduct, and aims to marry Pamela Anderson. The majority of the film is "real". Cohen, as Borat, wanders around real situations with normal citizens, uncovering bizarre beliefs, truths and realities. So, in essence, we get a bizzaro version of Candid Camera featuring a fictional host, similar to, but darker than, the Jamie Kennedy Experiment TV show. The majority of the entertainment comes from Borat himself. He is wonderfully unpolished. Whether spouting racist/sexist/ homophobic remarks, or gleefully making strange sexually profane announcements, he never becomes a hateful caricature. There is a strange innocence to him that allows him to transcend his politics. He becomes a figure of fun, making us his willing accomplices. When he interviews a women's liberation group and announces that women have brains the size of squirrels, we feel more sympathy towards him than the horrified women. The character has hateful beliefs, but he never comes across as vindictive. He's like a young child repeating naughty words he's just heard. It becomes infectious, waiting to see how people will react to him. It's interesting that a great deal of the people he interviews reveal their own prejudices in a far uglier way. The majority of the credit for the films success has to go to Cohen. He's fearless at walking a tight-rope between the hilarious and the unforgivably detestable. When he finds himself at a bed and breakfast run by two kind elderly Jewish people, his skills as a satirist are razor-sharp. Convinced that they have transformed into two cockroaches, aiming to kill him, he throws money at them and flees panic-stricken from the house. By illustrating the irrationality of Borat's racism he highlights the ignorance behind all prejudices. Cohen, who is Jewish, is so successful at this that the film has perhaps more impact than a "serious" film on the subject. Its brilliant work, and I hope the Academy is paying attention. I've also got to give credit to Ken Davitian (pictured with Cohen), as Borat's producer. Like Cohen, this man is fearless. During the film's climactic naked wrestling match between Borat and Azamat we are shocked how far these actors will go for a laugh. Davitian strips away any sense of dignity and gets real laughs, and fully inhabits the character. I was extremely surprised to see that Davitian has quite an extensive filmography (http://www.imdb.com/name/nm0205772/). He's so believable in the film; I almost bought his character as a real person. I've also got to say that director Larry Charles is brilliant in the staging of the film. Those familiar with Charles previous work on Seinfeld and Curb Your Enthusiasm know that this guy has the goods when it comes to brilliant dark comedy. His participation in this film is invaluable, and I look forward to seeing more films from him. I feel confident in recommending this film to all of you. It may shock you. You may find it very offensive. But it deserves to be seen as much as the typical "important" Oscar-bait films being released in the winter. It's an oddly powerful film that flouts conventions and is unique and a breath of fresh air. Do yourself a favor and go to the theatre. Seeing it with an audience will be far superior to sitting in your quiet TV room watching it on DVD. Either way, you won't forget Borat! any time soon. High five!